Moving Notes… | The Happy Wonderer ~ ellen b. One of the challenges of our move was this Chickering Baby Grand Piano that we have had in an airtight coffin in our old garage/shop structure for 20 years. We moved it with us because of our daughter’s memories associated with it of her and her “Gommy” (paternal grandmother). Dear’s mother was musically inclined and she taught our Katie on the piano in her early years. We loaded it into the container in Kenmore with 5+ and it was a struggle. It was the last thing left in the container here in Colville and our Colville son recruited 3 of his co-workers to help unload it on Tuesday evening. Dear researched the best way to deal with a Baby Grand and we were so happy to see it in it’s place with little struggle. So thankful for our son’s willing helpers and their strength to move this beast into our living room. We are also very thankful that our new living room has adequate space for this heirloom piece. Now all we need to do is to find a piano tuner in our little community. We continue to unload boxes and find the best places for our many possessions. We take our cardboard to the community recycling center and we will be taking our garbage and other waste to the dump. It’s a whole new way of life for us here in the country and in a smaller community that we’ve ever lived in. Dear has changed out many lights in our new place and that has brought so much more efficient light into our home. I am so thankful for my Dear and all his handy man skills. Today I did some watering in our greenhouse and picked some tomatoes and in another garden bed picked some corn. I am not a gardener in any sense but hopefully I’ll learn some new skills or entice our daughter in law to use her amazing gardening skills here at our new spot. I need to come up with a name for this new home. Time will tell. Soon with all the boxes unloaded and broken down and hauled away I’ll be able to sit and enjoy the views and enjoy your posts. Although uploading and creating posts with satellite connections are slower I will be able to persevere and continue on. Thank you for bearing with me. Posted on September 27, 2018 by Ellen •	This entry was posted in Moving and tagged Chickering Baby Grand Piano. Bookmark the permalink. 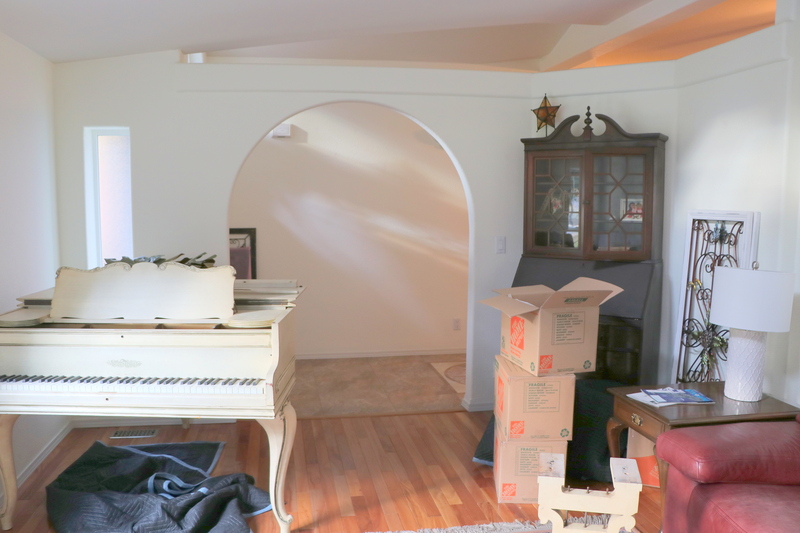 …my daughter has moved here baby grand several times! It looks like it’s found a comfortable spot in a pleasant room! What a nice story about your baby grand! Continue to enjoy unboxing and settling into your new home. Hello, wonderful story. I am glad the piano could be moved into your new home. There will be more happy piano memories in your new place. Have a happy day and weekend! Glad you had some strong, young helpers with that piano! You are getting so much accomplished and so quickly! so glad you are able to have the piano in your home. Now we need to plan a trip when Dave and Kristin can come up and have them do a concert!! So glad the piano has found the perfect spot! One day at a time, Ellen…and soon it will be ‘home,sweet home’. I really, really like that piano! Antiqued cream? It’s beautiful! It will all look like ‘home’ before you know it!! Love the baby grand! Glad to hear you were able to move that beautiful baby grand. So, we both have piano stories! I contacted our church musical director to get a recommendation for a piano tuner. But it might be a few months until he has enough business in this area to make sense for him to come out! I love that arched doorway! What a nice story of the piano and it’s human connections. Read and enjoyed both “piano posts” so much. I’m glad you’ (and Addie) are able to love it for now while you wait for your daughter to have the right home for it. Loved the new and old pictures with the family and the piano.